Tyler Gorman/Contributing Photographer A student uses a JUUL on campus. Many students are violating the University’s tobacco-free policy by using the devices. Although Binghamton University implemented a tobacco-free policy in August 2017, some members of the campus community are violating the policy, smoking cigarettes and e-cigarettes on campus. BU initially restricted the use of tobacco and electronic cigarettes on campus in an attempt to promote a healthy environment, according to the policy, which was created by the Environmental Health and Safety Office. With the ban on tobacco products, BU students have been turning to an alternative — JUULs. 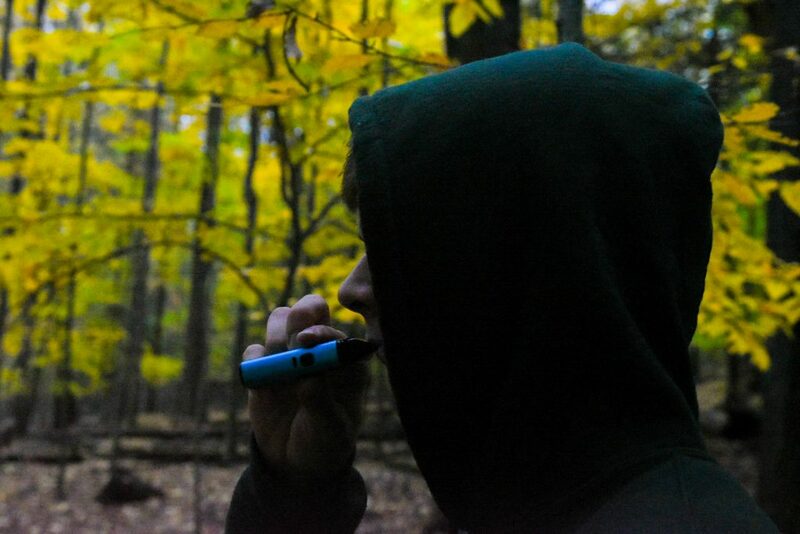 The JUUL is an electronic, rechargeable vaporizer that carries patented juice cartridges, or pods, that contain nicotine and come in a variety of flavors. Originally, the device was created and marketed as an alternative to smoking tobacco. Since JUULs came on the market, they’ve quickly gained popularity among high school and college students. According to a 2017 report from the Centers for Disease Control and Prevention, electronic cigarettes were the most popular tobacco product used by high schoolers, with 11.3 percent admitting they used the devices. According to JoAnn Navarro, vice president for operations, and Johann Fiore-Conte, assistant vice president for health and wellness, JUULs and other types of electronic cigarettes are covered under the tobacco-free policy because they deliver nicotine to the smoker — as much nicotine per pod as contained in a pack of cigarettes, according to JUUL’s website. Nevertheless, they appeal to students, particularly because they are small and easy to hide. However, students are still using JUULs around campus, often as an alternative for traditional cigarettes, which students see as directly violating the University’s tobacco-free policy. For many students, such as Allison Levy, a sophomore majoring in biology, the policy is unclear on JUUL use. Uncertainty on the policy has led students to use JUULs on campus without trying to hide it, according to Grace Sullivan, a junior majoring in integrative neuroscience. Sullivan said she has seen students using electronic cigarettes across campus, including in indoor spaces. Part of the confusion seems to stem from a lack of enforcement. One student, a senior majoring in financial economics who wished to remain anonymous, said he regularly uses JUULs on campus without fear of consequences. Because JUULing isn’t illegal, the University Police Department and its officers cannot enforce the rule, and individuals using tobacco on campus cannot face criminal or legal consequences for doing so. According to Navarro, students who are repeatedly caught violating the policy can be sent to the Office of Student Conduct. However, the tobacco-free policy is not in the Code of Student Conduct for this school year, which would prevent them from facing official Student Conduct charges. The policy states the BU community is expected to politely inform offenders of the policy and ask them to stop. However, several students, including Sullivan, said they would probably not say anything if they observed someone smoking or using an electronic cigarette. Nevertheless, even with the lack of enforcement from the community, some students choose to consciously follow the policy. Levy said she chooses not to JUUL on campus because she fears she could be judged by others. According to Jazell Johnson, director of Student Conduct, the Student Code of Conduct Committee will be reviewing the policy and potentially adding it to the Code of Conduct for the 2019-20 academic year. Until then, enforcement of the policy is left in the hands of students, many of whom, including Orlando Santiago, a sophomore majoring in physics, say they won’t approach individuals violating the policy.